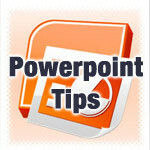 Recently, a reader asked me how to present without using any of the animation he had created. You can do that in the Set Up Show dialog box, but I realized that most people never go there, so they don’t know its settings. I thought I would systematically run through this useful dialog box. The Set Up Show dialog box has settings that determine what happens when you go into Slide Show view and deliver your presentation. You can use these settings for many purposes. 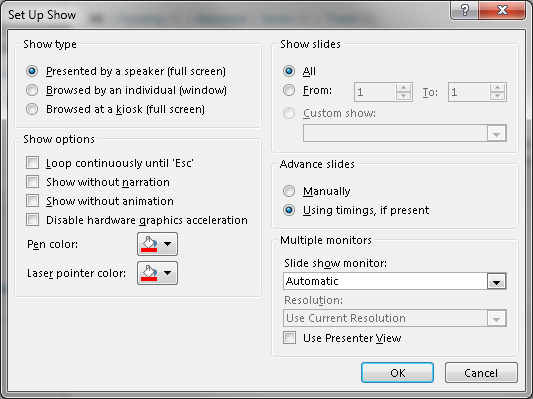 •Presented by a speaker (full screen): This is the default option. Slide Show view is full screen and you can click from slide to slide. •Browsed by an individual (window): If you choose this option, Slide Show view is not full screen. Instead, you get a resizable window. You can click from slide to slide.